Home › JEWELLERY BLOG › We're popping up at Boxpark, Shoreditch! We're popping up at Boxpark, Shoreditch! 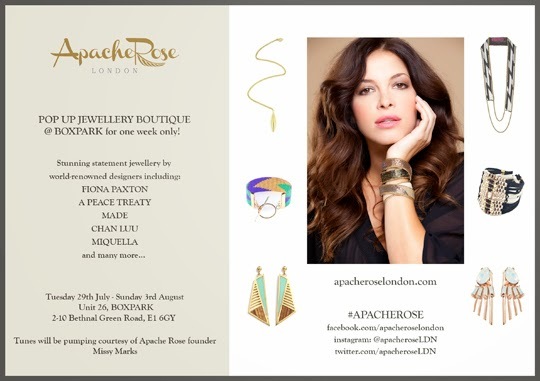 Online jewellery boutique Apache Rose is popping up at BOXPARK Shoreditch for its first physical retail presence (28th July - 3rd August). For accessories fans looking for statement yet affordable jewellery, head to the week-long shop at UNIT 26, BOXPARK to buy new-season pieces by fresh emerging UK and international designers. The concept for Apache Rose was born as a result of founder Anna Burke’s fascination with the unique and interesting statement jewellery pieces that she discovered while travelling, most notably those with a Native American and tribal edge. As the trend for statement jewellery has steadily grown, Anna felt that there was a significant gap in the market for unique, luxury statement pieces at accessible prices, and this is where the idea of Apache Rose London was born. Also being a DJ and radio presenter in London (Missy Marks), Anna believes that music and fashion go hand in hand and loves having the opportunity to explore and further develop the relationship between the two. She will be on site running the pop up and pumping some funky tunes out of the shop all week long, so head down and say hi. Hitting the shelves of Apache Rose during the week long pop up is the incredible new HFCO (Handicrafts from Colombia). Encouraging sustainable artisan craftsmanship, using traditional techniques in Colombia, this fab new jewellery brand brings beautiful, bold and bright tribal inspired designs to the streets of East London. Members of the Ethical Fashion Forum, Apache Rose are proud to be showcasing their stunning collection for the first time at Boxpark. Adding another element of fun to the week's proceedings, on the first day that the pop up opens (Tuesday July 29th), the incredible artist and musician Gideon Conn will be on site creating an exclusive hand-drawn doodle on one of the walls of the shop, so come on down and watch him do his thing. 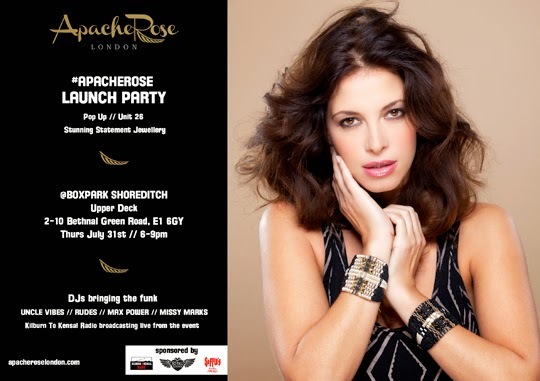 The fun continues throughout the week as Apache Rose celebrates the launch of the pop-up with a party on the Boxpark Upper Deck on Thursday 31st July, 6-9pm. Kilburn to Kensal Radio will be broadcasting live from the event! The pop up shop will also be open so you can browse jewellery and soak up the party vibes!